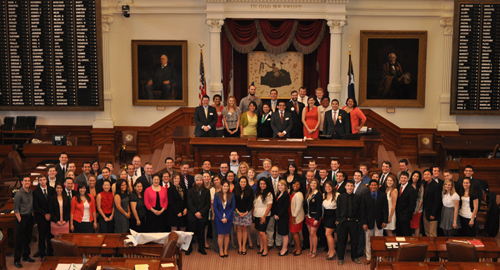 The Texas College Republicans held their 2012 Convention on March 24, 2012, in the legislative chamber of the Texas House of Representatives. 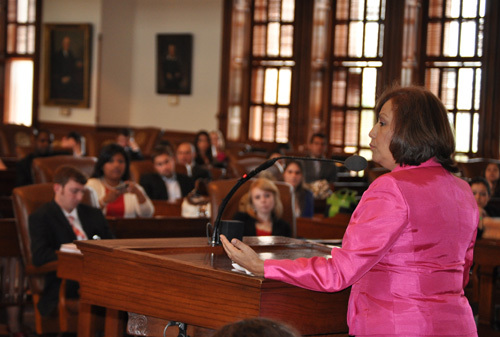 TexasGOPVote sponsored the Honorable Rosario Marin who served as the 41st Treasurer of the United States under George W. Bush. 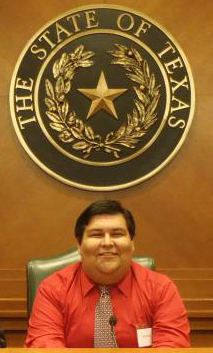 State Liaison for the University of Texas College Republicans Saul Mendoza describes the Convention below. Whoever said that the Republican Party ignores Hispanics has obviously lied. 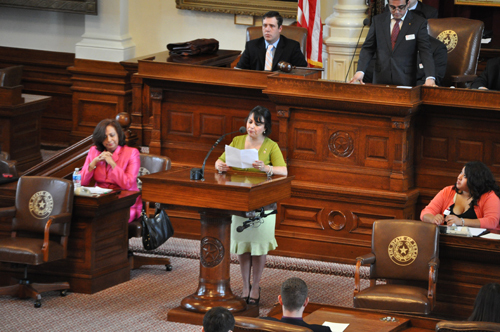 Saturday, March 24, 2012, the Texas College Republicans hosted their annual convention at the State Capitol in the House Chamber. This convention was a big shift from what we had seen in previous years as we saw a huge “Latin flavor” to spice up the weekend. It was clearly evident on Friday night when we had the Hon. Dianne Costa, candidate for Congress for TX Congressional District 25 sponsoring our welcome reception. Mayor Costa spoke about how she is running just like any other candidate, putting her record and achievements over the racial labels used in society. As our guests left, behind the scenes, some of us stayed in the reception room and discussed how we felt this was going to be a convention honoring our Latino and Hispanic values, and we joked about who could make the best rice, whose mom made the best tamales and enchiladasince, and since it was during Lent, capirotada. Lastly we joked about our next convention being a tribute to Quinceañeras or a Selena Vive Tribute. In the morning we all headed to the official start of the convention where many of us were once again greeted with “hola mijo” and “ay, ¿mijas como están?” A fellow Hispanic CR, Krista Aguilar, Secretary of the UT College Republicans, mentioned that she felt like she was at home and amongst family. 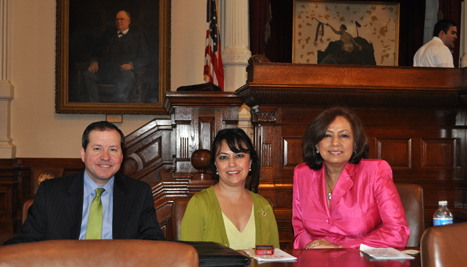 First we heard from Ivan Andarza, National Committeman from the Latino National Republican Coalition of Texas. Mr. Andarza spoke about how great it was to see a group of young Republicans gathering on a Saturday to promote not only the conservative agenda but the importance of the Latino community in the Republican Party. 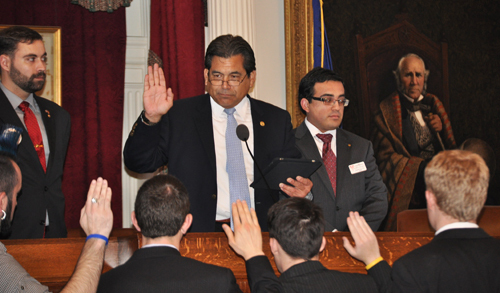 Mr. Andarza is also Governor Perry’s appointee as Chairman of the Texas Guaranteed Student Loan Corporation. Next we heard from Adryana Boyne, National Director of VOCES Action. Adryana is one of the most well know Latino voices in the country. Mrs. Boyne spoke about conservative moral and fiscal values and her support for photo voter ID, which she enforced was not racist and only a measure to prevent voter fraud. She also mentioned that we need to work toward getting the Latino vote and empowering them to vote, especially since we are a significant portion of eligible voters in the state of Texas. 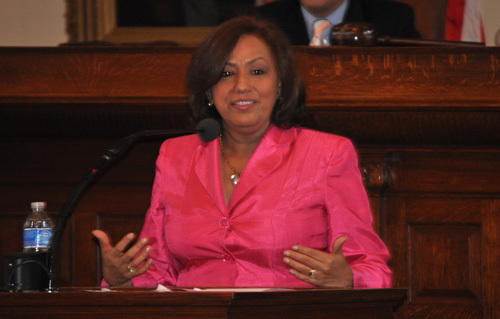 Mrs. Boyne encouraged all the college Republicans to get out, engage and embrace all people regardless of race, ethnicity, color or the way they look, and ended her speech introducing our keynote speaker: The 41st US Treasurer, Rosario Marin. Ms. Marin began by giving thanks to TexasGOPVote and to Adryana Boyne for bringing her to Texas and to the leadership of TCR. She spoke of how she achieved the American Dream and how she had chosen to become a citizen of the United States. Her humble story of how she started as the assistant to the receptionist to being the US Treasurer was inspiring to all our members. She mentioned having to overcome the challenges that came from having a son with Down’s Syndrome, having to compromise on her dream Quinceañera, having her brother have the priority to attend college, and many others. However, she cherishes these obstacles as she worked hard to overcome them and worked her way up in politics on her own merit.The last job she ever applied for was to be assistant to the receptionist. Ms. Marin also expressed the need of a sustainable workforce in the USA and the need that Republicans have to bring a sensible immigration solution. Both, Mrs. Boyne and Mrs. Marin got standing ovations after their speeches, not only by the Texas College Republicans, but by visitors at the Capitol who seated and remained at the Galleria listening to the speeches. Later that day we handled our state business and a resolution was proposed that would require TCR to ask the party to secure seats for minorities and students to be a part of the delegates to be sent to the Republican National Convention. Many saw this as the organization implementing a quota and a form of affirmative action. One Hispanic Student, Ramiro Jaime, spoke out and called it an insult to himself as a Hispanic. He argued the resolution implied that he could not be a delegate on his own merit and needed assistance to make it happen which it is not so. He stated that “If it looks like affirmative action, sound like affirmative action, it is affirmative action” and the floor broke into cheers and clapping. The resolution failed to pass with a 65-4 vote. On Jaime’s way back from the bathroom to the House Floor later that day, he was stopped and thanked and congratulated for his powerful message. VOCES Action, TexasGOPVote, Hispanic Voter Network, Latino National Republican Coalition of Texas, Amigos de Patriots, Associated Republicans of Texas, Empower Texas, and Carpets West.